Amber Hsu (徐碧莉//xúbìlì) is a Chinese-born, US-raised, UK-based writer, filmmaker, visual artist, and small press publisher. She is also the creator of #OnePoundPoems. She has written for the Royal Shakespeare Company, the Royal Court Theatre, the BBC, Islington Youth Theatre, and National Theatre Studios amongst others. In 2014, she was awarded a Film London London Calling Award and commissioned to make her first short film: Next Time. Her illustration work has appeared in such places as 3×3 and i-D magazine amongst others. 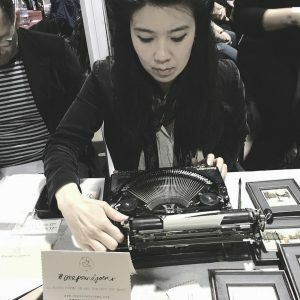 In 2013, she conceived of and created Tiny Pencil — an independent, artist-led, anthology artzine and press dedicated to the lead arts. Once, she also worked in a morgue. Find her on twitter at @amberhsu and instagram at @heyamberhsu. Or get in touch at: amber@amberhsu.com. For literary enquiries please contact Emily Hickman at The Agency .